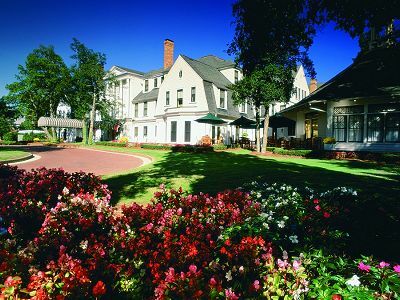 The Holly Inn is a Four-Diamond hotel and part of the famous Village of Pinehurst golf resort. 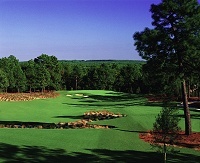 Pinehurst is a golfing mecca of eight championship courses, including the legendary US Open venue No. 2. Away from the golf course, Pinehurst offers bike trails, boat rides and even horse-drawn carriage rides through the historic village, all helping to capture the feel and atmosphere of a bygone era. Many period features have also been retained at the Holly Inn to give it an authentic sense of Southern grandeur. Guests of the Holly Inn have access to Pinehurst’s 31,000sq ft Spa and Fitness centre – just a short walk away. The Holly Inn also has its own quiet enclave pool on site, with guest access to the Pinehurst Resort main pool at the Carolina Hotel. The Holly Inn has 82 guest rooms including suites and a Bi-level Honeymoon Suite in period décor. It is also home to the 1895 Grille – a Four-Diamond restaurant serving Southern-influenced cuisine where presidents have dined. The beauty of Pinehurst is its slow and easy pace of life, the vibrant and welcoming bars, southern hospitality and cuisine, and, of course, great golf all within a most endearing woodland countryside. The 82 Four-Diamond/Four-Star ranked guest rooms including suites and Bi-Level Honeymoon Suite are all elegantly decorated in period style with rocking chairs, rich woods and traditional lamps. There are modern facilities such as high-speed internet access free of charge, while room and valet service is also available. 1895 Grille: The Four Diamond-rated restaurant in the area serves an exceptional offering of flavours straight from the Carolinas. Award-winning chefs also prepare nightly specials, making the experience new each time a guest visits, and the specialty triple chocolate souffle makes it feel like heaven! Dress Code: Dinner - dress slacks, collared shirt and dress shoes for men; Corresponding attire for women. No jeans or denim allowed. Dinner (Wed-Sun). The Tavern at The Holly: Casual, pub-style eatery with an authentic Scottish oak bar as its centerpiece. Serves lunch and dinner daily, as well as full beverage service. The menu features a variety of panini, salads and soups for lunch, and pasta, beef and other entrees in the evening. Outdoor patio seating also available seasonally. The Carolina Dining Room: The main dining room at the resort. Classic Southern style offering breakfast, lunch and dinner daily to live piano music. Dress Code - Dinner - Dress slacks, collared shirt and dress shoes for men; Corresponding attire for women. No jeans or denim allowed. 91st Hole: Located in the Resort Clubhouse, it's the perfect place to talk about the drive that got away - and the putt that didn't. Also serving light snacks. Dress Code: Resort casual. The Ryder Cup Lounge: Relive the fabulous moments of this famous event held at Pinehurst in 1951. Memorabilia of the event's history surrounds you as you enjoy a favourite beverage like the Arnold Palmer - all within easy access of the Carolina Hotel lobby. Lunch, dinner or a late night menu available. The Donald Ross Grill: Favourite lunch eatery named after the famous head professional and course designer. Located at the Resort Clubhouse, you'll enjoy salads and sandwiches, homemade soups, hot entrees and even a quick buffet during the busiest seasons. Fairwoods on Seven Dining Room: Only a shuttle away, the Fairwoods Dining Room is known for its fabulous Cobb Salad, Burgers and Chef Specials. An elegant dining room, it overlooks a pristine lake and golf course. The Carolina Coffee Shop: An early morning cappuccino. A late afternoon latte - or better yet, a smoothie or iced coffee. The coffee shop, located off of the lobby of the Carolina hotel, is great for a hot or cold one on the go, or a place to enjoy a quick sandwich or pastry. The Holly Inn has its own secluded pool, while guests at the Holly Inn enjoy full access to a larger pool at the Carolina Hotel. At the Pinehurst Golf Academy, there is a full-day “Discover Golf” program, offered seasonally, which includes beginner instruction, lunch and play on a Pinehurst course with Advance Reservations required. In addition, there are many other activities at Pinehurst including biking, fishing, boating, croquet and kayaking. There are also walking and jogging trails. Nearby McLendon Hills offers horse riding. Historic Walking Tours through the historic district of the Village of Pinehurst are also held each Monday and Wednesday morning at 10am in the summer months. The Spa at Pinehurst is an oasis of luxury, with 40 services from massage to full body treatments for women, men and teens. Aquatherapy treatments, salon and fitness centre with treadmills and free weights combine to rejuvenate the body. The Village also has a high grade tennis facility, complete with tennis coaching, and lighting for evening play. There is a wealth of independent shops within 15 minutes of the Village of Pinehurst resort; nearby Cameron Antiques features over 20 shops in a quaint town atmosphere. The Malcolm Blue Farm offers seasonal tours of its Revolutionary War homesite; House on the Horseshoe is approximately 25 minutes away and has annual Revolutionary War re-enactments. Take a walk through the Sandhills Horticultural Gardens, located at Sandhills Community College in Southern Pines. Seasonal floral displays, herb gardens, English pathways and Japanese Hollies are among the many sections of this expansive walking garden. Open seasonally. The Mobil 4-star Spa at Pinehurst is a 31,000sq ft facility where you can escape, re-energize and indulge in more than 50 relaxing and refreshing treatments. Treatments draw on the essence of the South with holly berry, pine, peach extracts and magnolia helping to soothe away your cares. Day packages are available as well as special programmes for couples and even kids. Ascot Golf packages are interchangeable with 1 - 50 minute Spa Treatment per person per night (choose from a list of select treatments). Please ask your Ascot Golf Sales Agent for further details or include your Spa preferences with your Golf Holiday Booking at Pinehurst Holly Inn. Pinehurst No. 4 was renovated by Tom Fazio and reopened in 2000. The greens are modern in design and there are over 140 pot bunkers to avoid from the tee and on approaches. The course offers some of the best scenery at Pinehurst. Located a mile away from the Main Clubhouse, Pinehurst No. 7 was renovated in 2003. 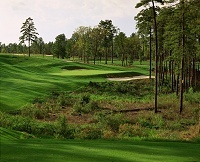 Located on some of the most rugged land around the Village of Pinehurst, the course has a mountainous feel. Designed by Rees Jones, noted for large undulating greens and spectacular scenery across the North Carolina countryside. The No.5 Course has more water hazards to negotiate than any other course at Pinehurst. The layout also features variety - uphill and downhill, left-to-right and right-to-left, long and short par fours. Overall, it is a very playable, enjoyable 18 holes. Pinehurst No. 2 is one of the most famous courses in the world and a regular host of the US Open. It was the scene of Michael Campbell’s 2005 triumph and the late Payne Stewart won here famously in 1999. It will again host the US Open in 2014. The raised greens and their run-off areas are the main feature on this Donald Ross-designed course. Change in elevation is also a key factor on this course with penal bunkers and pine trees giving the golfer a serious test. Located around two miles from the main clubhouse, Pinehurst No.8 features raised greens with false fronts, dips, swales and run offs similar to No.2. Pinehurst No. 8 is an easy course to walk, with the greens and following tee boxes near together. A classical short course designed in 1910. The Pinehurst No. 3 course offers a very different test to the longer championship courses like No.2. The premium is on accuracy as most of the holes are tight. Accommodation in Standard Rooms, Breakfast, Green fees as listed, Buggy hire, Golf transfers, Resort Service Fee and local taxes (12%).